DETROIT (CNS) — In a city with the second-highest murder rate and highest violent crime rate in the country, peace can often feel like a hopeless cause in Detroit. But on a warm August night, with thunderstorms looming, at the corner of Gratiot and McClellan avenues on the city’s east side, peace and prayer were on the lips of Detroiters, friends and strangers alike. Taking Back the Night is prayer group started by the Archdiocese of Detroit’s Office of Black Catholic Ministries. Its objective is simple: asking God for peace on the streets of the city they love. Many motorists on Gratiot were honking, an encouraging sign for Leon Dixon Jr., director of Black Catholic Ministries. Taking Back the Night was at the corner of Gratiot and McClellan, in the shadows of Nativity of Our Lord Church, Aug. 15-19. The group relocated to the Cathedral of the Most Blessed Sacrament on Woodward Avenue Aug. 22-26 and was at St. Thomas Aquinas-St. Christopher Parish on the city’s west side afterward. Dixon said it is important for the group to meet at night, because that’s the time of day when most of crime happens. It also forces people to think of the ministry as “outside of the four walls” of a regularly daily job. 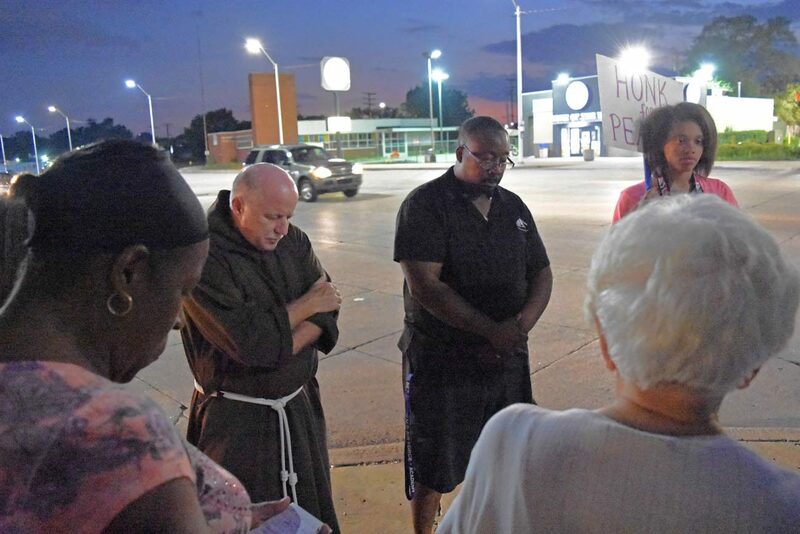 Going into the streets is what appeals to members of Taking Back to Night, publicly showing people someone is praying for them, even if they’ve never thought so before. Jenkins and other members said every honk of a car horn was an acknowledgement that people appreciate what the group is doing for Detroit and a reminder that God is present in the city. Please keep on praying, doing penance and acts of charity to get your city back. God is listening to you and will grant your request in His time. What you are is wonderful. Detroit was once a great city and will be again. Keep the faith.